Hurricane Harvey caused more than $200 million in crop and livestock losses, according to Texas A&M University agricultural economists. The hurricane specifically cost local farmers $93 million in livestock losses, $100 million in cotton losses and $8 million in rice and soybean losses, the economists said. 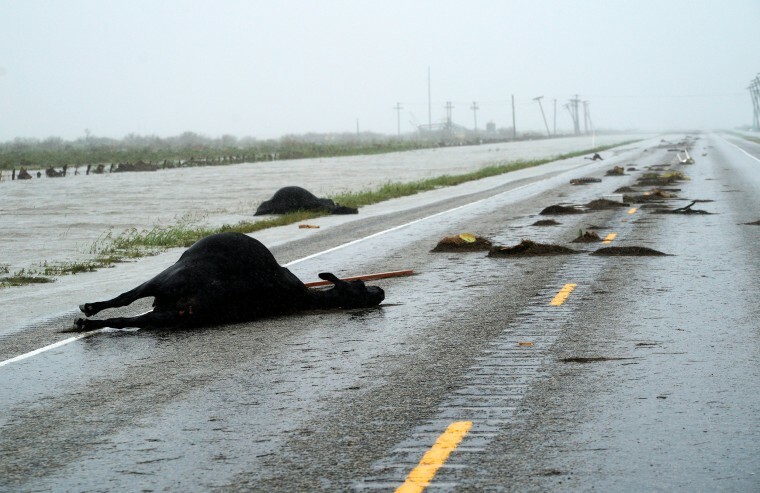 “The effects of Hurricane Harvey will linger for quite some time with our Texas farmers and ranchers,” Doug Steele, agency director for Texas A&M University’s AgriLife Extension Services, said in a statement. The amount of livestock losses also include industry infrastructure, as well as hay, cattle, calves and other animals, according to Texas A&M economist David Anderson. Costs will quickly add up for farmers who need to replace hay that was destroyed by the hurricane before the winter feeding season, Anderson said. Hay currently costs $63 per round bale on average. But the livestock losses were reduced partially by the U.S. military dropping hay bales to farmers, as well as donations from neighboring states and other Texas farmers who were not impacted by the storm, the economists said. Hay and feed donations were valued at more than $1.3 million as of Friday. “Overall, these livestock loss numbers could have been far, far worse had it not been for the quick action of ranchers ahead of and during the storm,” Anderson said. Hurricane Harvey also resulted in $62.4 million lost from cotton lint on the stalk, and an additional $9.6 million lost from harvested bales damaged by the storm, Texas A&M economist John Robinson said. “You either had cotton that was on the stalk ready to be harvested and then taken out by Hurricane Harvey, or you had cotton modules sitting in the field only to have been damaged by wind, rain and/or flood water,” Robinson said. Multiple industries tied to commercial and recreational fisheries also suffered losses related to damaged vessels, industry infrastructure and gear, Texas A&M economist Andrew Ropicki said. The industries also lost productivity due to interruptions from storm recovery efforts. The commercial oyster industry is expected to suffer severely as well, due to productivity losses related to excessive freshwater in local bays, Ropicki said.